While it isn’t very often for my family to ask me to make our family pictures, I typically have fun with it. This go around, which is the first time in my family’s history, I decided to play with a feature on my camera that allows my phone, the iPhone 6S, to work with FujiFilm X-T1 as a wireless remote. I was able to effortlessly get myself into the shot and still have the control I wanted over the camera settings– and see what those changes did in real time! This specific app works with the X-T1, X-T10, X-E2, X100T, X30, FinePix S9900W, FinePix F1000EXR, FinePix S1, and FinePix XP80. The process on the Fujifilm X-T1 was fairly simple, there’s an app you download from the App Store called FujiFilm Camera Remote that lets you do some cool things like transfer JPEGs from the camera to the phone besides acting like a remote. Once you get the app, you’ve got most of it taken care of. The next step is to pair your phone with the camera by first activating the X-T1’s wireless mode by hitting the Wi-Fi button on the top of the camera and then going to the Wi-Fi page in the settings app on your phone. 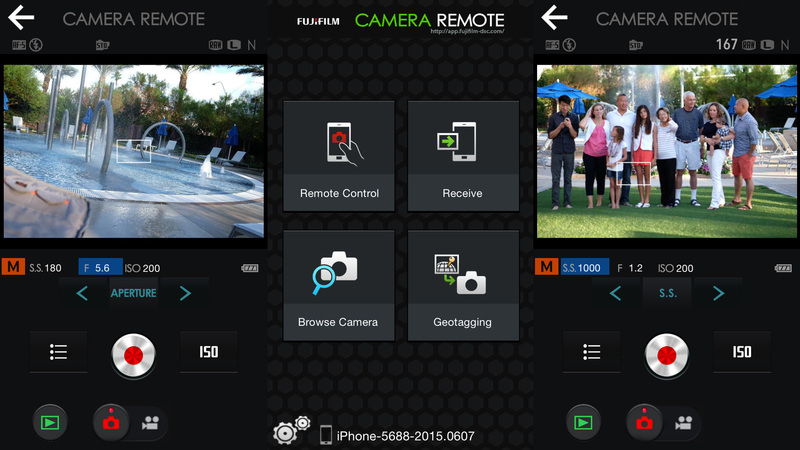 Once you’re connected, you can choose to wirelessly control your camera from your phone. For a full list of instructions on how to pair your wireless-capable Fujifilm Camera to your iPhone, click here. After I got all that setup out of the way, I put my camera on a tripod, started up the wireless function on it, and got into frame. It was nice being able to change the focus points and settings straight from my phone rather than running back and forth. I could’ve just set one of the automatic settings, but it always feels better to be in control of your camera. The screen is pretty detailed with settings for settings from color, white balance, image size and flash settings. It basically outlines everything that you’d think that you’d need. The app is pretty versatile, you can choose between Shutter Speed and Aperture and ISO settings. You can switch between video and photos as well. Overall, the responsiveness was pretty good for being 25 feet away. Once I got to about 30 feet away, there was some stuttering and delays in updating the live feed. Your milage may vary based on your environment. The app also allows for wireless transfer to your iPhone and geotagging, although I rarely use the latter function. I tend to use the wireless transfer coupled with Airdrop on the iPhone to share photos instantly with people around me. It’s quite handy when you can throw a photo from the camera onto the phone to edit and send it straight back out to someone else or even a group. While I’m not a family shooter, this did work out pretty well for a on the spot family shot! Camera remotes are fairly popular, and are still quite essential for many types of photography from selfies and family pictures to time lapses and ridiculous angled shots. The benefit of these remotes are a little old fashioned, but are still useful: lets you place your camera in an area that you wouldn’t normally be able to, lets you trigger the shutter without disturbing or shaking the camera, lets you get in on the action. With the addition of wireless capabilities, those benefits are even more apparent.